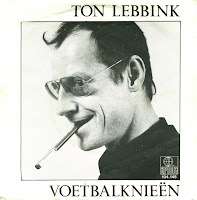 Dutch poet and former nightporter Ton Lebbink released his debut album 'Luchtkastelen' in 1982. His debut single 'Voetbalknieën' was lifted from this album. Although it never made the charts, the album and single are a bit of a cult favourite these days. With nonsensical lyrics and quite danceable music, 'Voetbalknieën' is an astonishing piece of work. I bought the single in 1989, seven years after I first heard it thanks to my sister, who'd bought the single - and later even the album - because she thought it was a funny track. It stuck in my mind, somehow. I'm still glad it did.